The CWE currently allows all graphics used to be altered by the player/developer. That was one of the reasons I wanted some of the people who made graphics for the Banshee site on board. The image I posted below is what I am using now but I have actually tried a number of types and sometimes the mix shows up in the screen shots. All hex terrain is handled currently through 100x100 pixel gif files. Like wise all hex-side graphics. Unit graphics are different. They use a small gif file representing a single man (although the man represents about 10 men). I then build the lines and column formations from this creating a bitmap overlay for the different strengths. I haven't reach the point that I have time to implement specialty units like engineers and boats but there is no reason I can't. Seasons are; however, supported. I have folders currently for four seasons but the graphics right now are all the same. Another job for someone with graphic skills. There is no reason seasons with specific weather conditions couldn't be added. The Scenario designer just selects the season to use. Right now they can't change during a scenario although I do support in a limited way modifiable terrain. The only implementation of this is the Cornfields in Antietam picture I attached earlier. Firefights and movement in the cornfield hexes slowly reduce their ability to block LOS. Units themselves had a large number of parameters attached to them that are configurable through the OOB including ammo. Most are now defaulted to things like 40 rounds per man and the standard artillery load outs. The OOB file is actually an XML file which can be edited with any XML utility like xmlnotepad. There the initial values of the Unit can be set like formation, facing, quality, fatigue, ammo, weapon type, location on map, etc. Something I haven't mentioned is that I use 12 direction facing in the game as well as the unit being forward or back of hex which means that a Unit has 24 positions within a hex. These are taken into account when calculating fire effects due to angle, altitude, and distance. I actually track the pixel position of the unit when I calculate LOS and fire. Relative altitude affects vertical angle of fire which is included in calculations on penetration. Downward fire will cause more casualties than upward fire. Here is a screen shot showing the program interface as well as a section of the Devil's Den scenario with the starting positions of Hood's Division along the Emmetsburg Road. This time the map is zoomed out quite a bit. The program has continuous zoom using the scroll wheel on the mouse. I have selected a hex which is outlined in red. I have also selected a particular unit, 47th Alabama which opened the detail window on the lower right. I won't go into a detail description of what you see but noted that Hood deployed in two lines, one forward of the pike and the other behind. Also one brigade, upper left behind the woods is deployed in column along with some artillery. This scenario is using some older clear terrain graphics which are mostly just solid colors. Sounds like a great game is being created. I am very grateful to John Tiller for creating and improving the games we play, but it has never been easy to get suggestions through to him. activation points which meant more movement and fire ability, as well as combat bonuses. You could increase your activation points at a cost in fatigue to simulate forced marching. They even had smoke effects simulated by decreasing effectiveness of fire in intense combat areas. It has been many years since I played those games, but the designers implemented some pretty good ideas, with pretty basic technology by today's standards. But what about utilizing assets that are more or less on hand? You mentioned the webpage, this game surely deserves a dedicated webpage but for now why not add a new forum section for it to this board? At least for now it would take away the need for an admin & moderators not to speak for designing a webpage, adding a forum, etc.. Same goes for Membership management that this club already has, I'm sure something could be worked out. And if the game gets a webpage all this could be transfered to it, at least the forum transfer is something that is usually easy done. Of course all this doesn't help with big tasks like graphics and sound but at least the minor stuff would be solved for now and all volunteers could help with the important aspects of the game. Myself I'm neither a programmer nor an artist, all I usually do is testing to see if games/scenarios work and depict the situation historically correct, I have done some beta testing over the years with the latest being AGEOD's "Wars of Napoleon". So if you find my skills useful at some point for the development I'm happy to help. A forum could be set up like the ones here which are probably relatively low cost. But one of the reasons for having a web site was that you need something capable of hosting the files that need to be downloaded and uploaded (in the case of people doing graphic work). The main game requires a 200 MB zip file and will probably be larger by the time its finalized. I had a GoDaddy site for the game but dropped it since it didn't look like I could handle the maintaining of a web site and have time to work on the game. I am retire but I have other interest too so time for developing a game is limited. A GoDaddy web site capable of supporting a Forums and 1 GB of storage runs around 8-10 a month plus whatever your domain name costs. A question, how "flexible" is the engine? Would it be possible to use this engine for the Napoleonic period too? Yes, but Napoleonic small unit tactics need a quite different emphasis. I am not enough of a Napoleonic expert to do that but I am enough of one to know how poorly games simulate that period. The game is capable of putting units into a variety of column, line and mixed formations but appropriate tactical equations would have to be added to properly use them. And, of course, any thing that attempts to simulate Napoleonic warfare would have to handle the cavalry charge and the various types of cavalry. The Civil War is much easier on this. There is just light cavalry and dragoons (Union cavalry was more mounted infantry). This is where most of the Napoleonic games I know of fail. They just can't handle the complexity of the coordination of artillery, infantry and cavalry used by Napoleonic armies. When you play HPS Napoleonic games in Turn mode you wonder why they had line infantry in the period. If you play it in Phased mode you wonder why they had any other formation but line. If you ever played Wellington's Victory you wonder why they bothered to have Infantry formations other than skirmisher. I have yet to see a game that can both simulate the tactical advantages of each formation and still balance them in all the ways they interact. The Cavalry charge is the most difficult thing for any non-real-time game to handle. It happens on a time scale that is to short for most turn based games. Mine might handle it but I haven't attempted it. I say it might because when the game executes your orders it does it on a six second time slice so even cavalry doesn't move to fast to evaluate its situational changes during the charge. Putting enough "smarts" into the handling of events during the charge would be a challenge. BTW are you making progress with your game? No. I am not seeing enough interest out there to justify spending any time on it. I may work on it some next year if I don't have anything more interesting to do. And, of course, any thing that attempts to simulate Napoleonic warfare would have to handle the cavalry charge and the various types of cavalry. that you could put each cavalry unit in during your movement phase; normal, disordered, charge or countercharge (plus dismounted for dragoons). If you put your cavalry unit in charge mode, you would choose an objective for the charge. At the beginning of combat phase, the computer would check morale for the unit and if it passed, the unit would charge the objective. During the charge, enemy cavalry units your opponent had previously put in countercharge mode would intercept if they were close enough and passed their morale check. Meanwhile enemy infantry units in the path of the charge would form square, disorder or rout based on computer morale checks. This was all accomplished with 64k technology. It has always mystified me that none of this ever made it into the Battleground games, let alone HPS. I doubt the interest is missing on an engine that seems solve all the lacks of the HPS/JTS series. Out of the small pool of active members that the club has the few people that showed willingness to contribute within this thread are a very good result. People not contributing isn't the same as people not interested, most will simply not be able to contribute as they lack what you search for. I just think of Le Grognards and how loooooooooooooooooooooooooooooooong it took that more than one person worked on it, the interest for that game was always there but it simply lacked the persons capable of contributing. And I think a real test should be done before judging the future of this game to see what interest there really is, a webpage with the ability to let the people show their support would be an idea, maybe even with the ability to spend money, it's the usual way that people unable to contribute show their support.. But for that one has to show something, screenshots, video of gameplay, details on how the engine works, etc. something that the people can really grab or they think it's just a typical Internet myth that sounds too good to be true. And, that is part of the problem. A Web Site with videos, screen shots, forums, etc. require something like a GoDaddy hosting plan and someone to set it up and administer it. I had set up such a web site but it was rapidly taking up all the time I had for the project and it wasn't even online yet. Managing a web site, answering questions, coordinating tester, getting testers, etc. requires considerable amounts of time which is why most games are developed by teams. I am a team of one who devotes at most one hour a day to the project. Which is why I posted to see if I could turn this into an open source project. But that requires a lot of people interested in making it happen and willing to donate free time to doing it. Even the "fun" part of game development can be quite tedious. For example, developing a game scenario covering Gettysburg. I have created the sub-map for a "Devils Den" scenario. I am using the Warren Survey 1868/1869 map. It requires some one to enlarge the download of this map to a size that you can see the slope lines for a 50 yard hex. These lines are faded so bad by the time you get to that size you will probably have to print it ins 20x20 hex size pages. Then you have to map the centers of the hex grid onto this page. 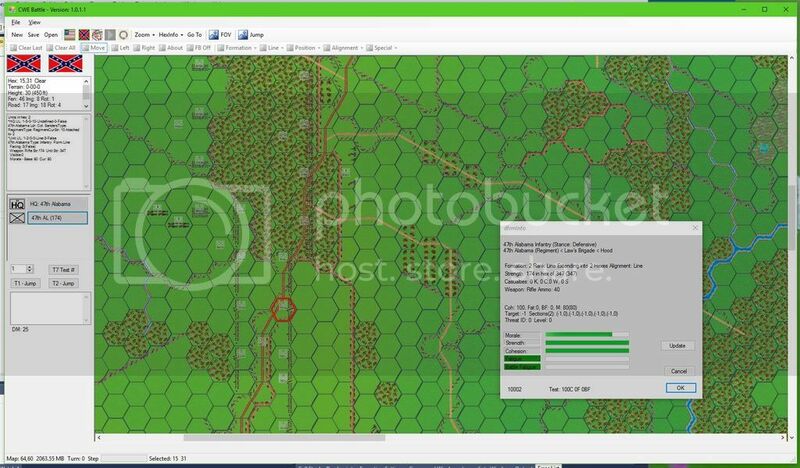 The with the CWE Map Editor create the hex grid and go through each hex converting the Warren Map heights into hex heights. Then you have to go back through the Warren Map determining what the dominate terrain is in each hex and setting that. Then you have to track down all the streams that flow through the area and map them to the hexsides. Then the wood fences, stone fences, roads, trails, etc. The Emmetsburg Road to Little Round Top area included in the Devils Den scenario requires a 60x60 hex matrix. After getting the map defined correctly you have to go back through it and choose the best looking version of the terrain graphic so it will look better. And, finally you have a map. Now you got to fill it with troops with the right OOB, leaders, numbers, arrival times, etc. and assign them ratings, etc. That takes some research. You can't go to the HPS OOB and copy theirs. So I end of with the problem. With the amount of time I have I can code, develop scenarios, manage a web site, test and debug, or make better graphics (which isn't likely, I can only draw flies). But a game development requires all of the above. For those waiting to see a working game with video's, etc. They are going to continue to wait because no one is really willing to commit the man-hours to make it happen. There is no money in it. If I tried to sell the game for just the cost of developing it, the price would be so high no one would buy it and there just aren't enough people willing to buy it at a lower price to pay for the game. It's why new paper board games on the Civil War are selling for $100. All they have to do is print a map, counters, player aides, and a rule book. There are actually some excellent games out there but they are tedious to play by mail even with something like Aide-de-Camp to help you. I understand that you can't pull anything off, but you are now that far that you need extensive support in various fields you need to take your time to make a presentation that draws the attention of the people to the game. And that page would have to bee made as public as possible. As I said, the feedback you got in this thread is already good, it's surely not enough but you can't really expect more from a club with just around 200 members. If you thought you get the necessary crew to finish the game on this club alone it was obvious that you had to be disappointed. Those people that really contribute to the club usually do that on the sister clubs too and by that are occupied running 3 clubs, and those not contributing to the club will surely not suddenly contribute to your game. What I mean is, what you got out of this club is OK, but to complete a crew you need to reach much much much more than just 200 people, you need to reach 20k at least I would say. Rest assured that is a combination that can hardly be found in this world let alone on this club. And, that is also an indicator of the problem. This forum probably represents most of the people interested in PBEM Civil War games. I hope it musters more than 200. At one time it probably had over one thousand. That is why I posted here. To see how much interest would be shown. A half dozen people isn't much. I have also been watching the Brother Against Brother forums. The game introduced about a year ago is an excellent PBEM Civil War game addressing many areas that JT/HPS games don't. It's forums look like a graveyard. At its height about a dozen people were active. Hopefully more than that bought the game but neither they nor JT publish numbers. But it does have a centralized server based PBEM system so it is easy to see how many people have issued challenges for opponents. There aren't any. Sometime I am going to test to see if anyone is even checking the sight for opponents by posting a challenge. All this doesn't inspire me to go put hundreds of man-hours into a game that no one is interested in. It has mostly served the purpose of keeping my mine sharp but I might be better off going down to the Del Webb club house and playing Bocce Ball. I thought this looked really interesting. Did you post this over at Grogheads? I feel like that is perhaps the most active wargaming forum I know of. If you ever make progress, I would coordinate playtesting! I have no technical skills.